Continuing on our quest to provide our customers with a broad range of integrations they can use to make their products smarter, we are happy to announce a new integration with a new partner: OriginTrail. This integration will allow EVRYTHNG’s customers to push selected transactions from and about products to OriginTrail’s cutting-edge blockchain solution, leveraging some of the core features of decentralization such as tamper proof transactions or consensus based verification. OriginTrail is building a specialized protocol for supply chains based on blockchain technology. Their goal is to augment the supply chain with some of the very things blockchains are good at. For instance, OriginTrail allows supply chain transactions to be immutable. It also allows several actors in a supply chain to validate data without necessarily having to trust each other. These are really exciting features and is a great continuation in EVRYTHNG leveraging some of the interesting aspects of blockchains while not reinventing the wheel. To make this integration a reality both teams sat together and collaborated on a connector. The connector was built as a Reactor script allowing our (or OriginTrail’s) customers to build a scalable bridge between the two platforms. This bridge is essentially capable of converting EVRYTHNG supply chain transactions (called Actions in our world) tagged with a createOriginTrail=true custom field into the GS1 EPCIS standard that both platforms use to communicate. The transaction is then automatically pushed to a decentralized OriginTrail node via its API and made available in the OriginTrail platform built on top of the Ethereum public blockchain. 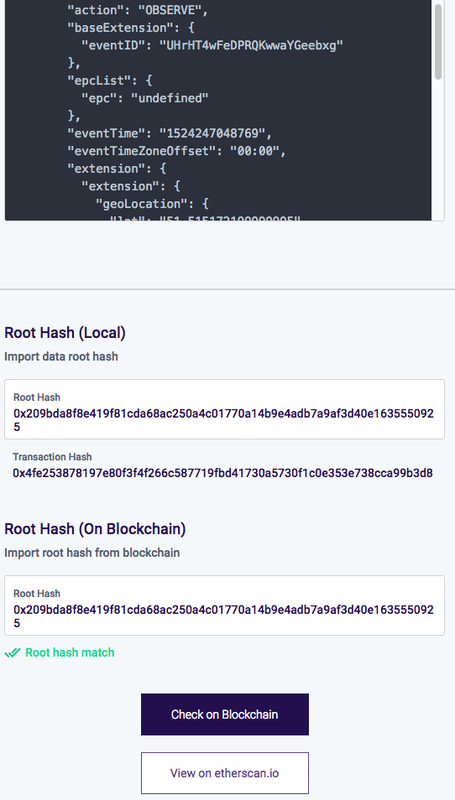 An OriginTrail verified transaction as seen in the EVRYTHNG Dashboard. 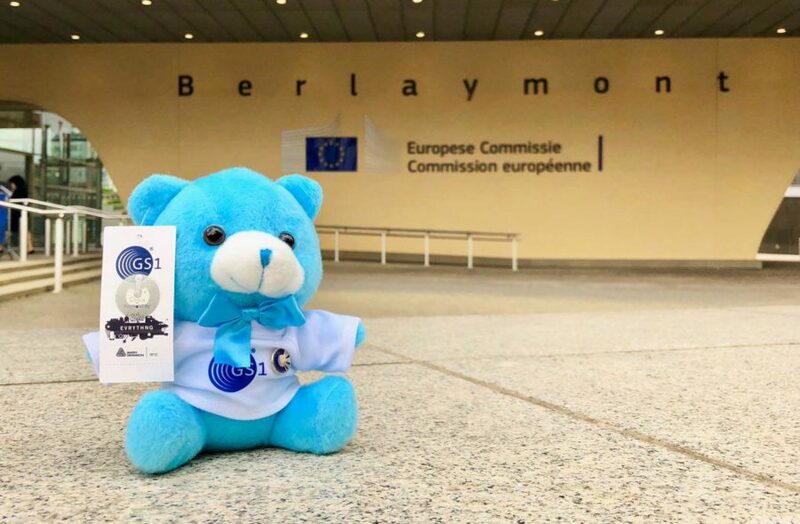 Barry the Bear at the EU Commission in Brussels! We tested the integration on Barry, the incredibly smart bear we created with GS1 for the GS1 Global Forum. Some of the key steps of Barry’s supply chain journey were sent through the OriginTrail – EVRYTHNG bridge to make them tamper proof, thanks to the immutability of blockchains. 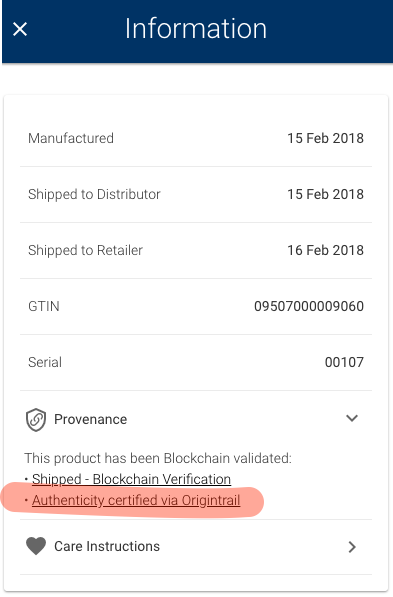 This basically allows building an authenticity certificate for Barry that can be verified on OriginTrail. 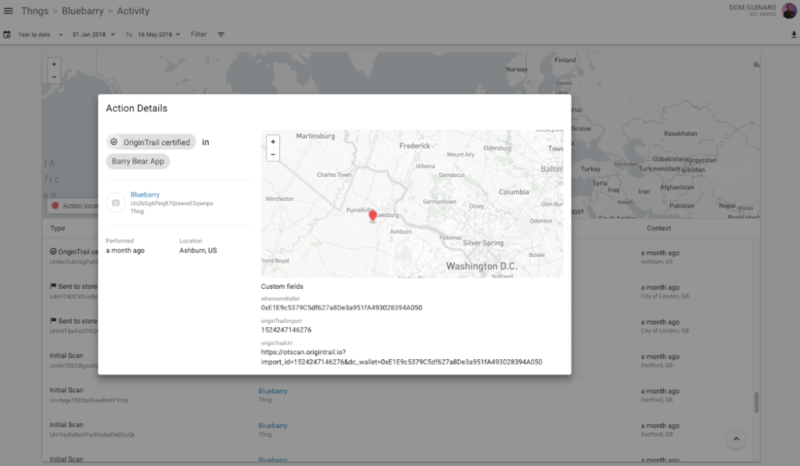 Barry’s Web app showing OriginTrail-EVRYTHNG certified transactions. These features were added to the Web app served via the EVRYTHNG platform when scanning Barry’s tag, closing the loop of making the verification features available to consumers. Our firend’s at OriginTrail then took the new version of Barry to the European Commission where they were invited to present solutions that can help fight counterfeit-related crime in the digital age in frame of a memorandum of understanding pledging to fight the sale of counterfeit goods online signed by companies like Alibaba, Nike, Adidas, and Channel. We heard Barry made quite an impression on the EU Commission 🙂 . After this successful Proof of Concept both teams are now looking at packaging the connector, making it available to any of our respective customers wanting to connect to OriginTrail’s network to leverage some of the unique features decentralization has to offer. This step will also include EVRYTHNG operating its own OriginTrail nodes to create a scalable and secure bridge between the two platforms. Stay tuned for updates on that and meanwhile check our other blockchain integrations.